Nature is a powerful teacher. Important to children’s development in every major way, the woods is a natural classroom to expand the learner in every way—intellectually, emotionally, socially, spiritually and physically. It is critical that the forest does not simply become a classroom, however, for human use with no regard to the bigger picture. 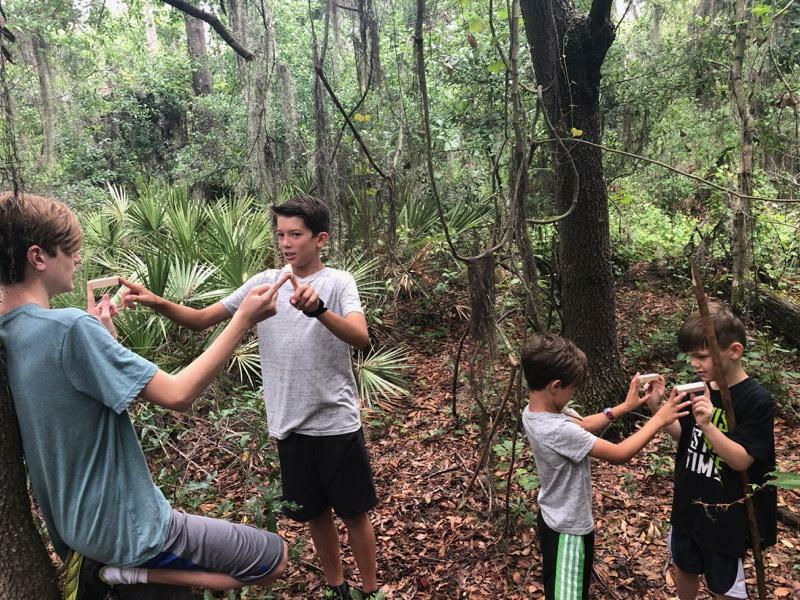 The benefits of connecting with nature abound and at the Deep Roots Nature School we work hard to operate under the guide of these 5 Core Principles. At the center of all ecosystems is communication. As Humans we think of this in terms of talking, but it also involves intonation, body language, eye contact and more. In nature, the communication within and between species is a matter of survival. Understanding the language of the birds, the movement of the animals, and the growth of the plants, lays a foundation for appreciating the intricacies and depth of real communication. Nature is both beautiful and harsh. Living in a time when comfort is the norm, food is abundant, and distractions abound, it can be easy to lose perspective. When stepping outside of the usual creature comforts, rain, heat, cold, bugs, thorns, and so much more reign supreme. All of this input brings a new awareness, an appreciation. Movements become more careful and the clues of the world magically unfold. Out in the woods, every action sets forth a cascade of change. The birds become silent, the lizards take cover, even the plants absorb the footsteps. Young people can feel unimportant, as if they have little impact on the world around them. Nature provides the perfect opportunity for feedback. Each person has the power to make positive ripples into the world around them. Maintaining their own personal thread of humanity is integral to the beautiful tension that is the Human Experience. Independence and confidence go hand in hand. Exploring the natural world in a meaningful way requires equal parts curiosity, skill, and calculated risk-taking. As young people develop skills and take reasonable risks, they gain confidence in their ability to tackle new problems and devise valid solutions. Through exploration, the natural Human desire to push new limits is met with knowledge about how the world works. “An environment-based education movement--at all levels of education--will help students realize that school isn't supposed to be a polite form of incarceration, but a portal to the wider world.” Life-long learners understand that as each layer is peeled away, more questions surface. The constant search for understanding leaves a person open to being flexible in thought in order to acquire the knowledge they desire. Each day is full of new wonder and excitement. click here Register for the Fall Semester!